I felt led before starting class to pray for Timi who could not make it because of finals in school. This would be the first time that I would bring prayer into this setting. God brought to my mind when Jesus publicly prayed in order to stir up faith in His work. “And Jesus lifted up his eyes and said, “Father, I thank you that you have heard me. I knew that you always hear me, but I said this on account of the people standing around, that they may believe that you sent me.” (John 11:41-42) We heard later in the week that Timi did great on her exams and Edina shared with her that we prayed for her in class. Our Bible study also focused on the amazing truth that Jesus was carrying out a plan devised before creation to bring about salvation. “This Jesus, delivered up according to the definite plan and foreknowledge of God, you crucified and killed by the hands of lawless men.” (Acts 2:23, see also Eph 1:3-5) As we talked about God's purposes and sovereignty, I brought up the amazing truth found in Acts 17:26-27, "And he made from one man every nation of mankind to live on all the face of the earth, having determined allotted periods and the boundaries of their dwelling place, that they should seek God, in the hope that they might feel their way toward him and find him.” I gave personal testimony of life events where I recognized God working to draw me to Himself. When I was just a boy, there was a girl in the neighborhood who was killed when struck by a car while riding her bike. This forced me to begin grappling with the matter of death at a young age. Later, closer to my teen years, I was in the back seat of a car when the teen traveling too fast around a turn lost control and we were launched into a field. I had no seat belt on and we were told later that it was a miracle that the car did not flip which would have surely lead to death. Once again, I was forced to think about life and death. These events along with the numerous Christians in my family and in my church continued to reveal that He was drawing me to Himself. I have begun meeting with Gabi K. and Zoli K. on Wednesday nights to give them more focused time where we can interact and have discussion about God's Word and life. In larger Bible study settings, they usually fade into the background and quickly become disconnected as the adults move the discussion in directions that don't speak to their personal season of life. Gabi is in a time of questioning everything. I believe Jesus has brought him to the point in his faith where He is asking, "Do you love me more than these?” (John 21:15) Gabi has come to terms with with the decision before him, knowing that if he says yes, it will mean drastic life changes. The matter comes down to whether or not he fully trusts Jesus with his life and his future. Please pray for Gabi to find the answers he is seeking and to make a wise decision. We were thankful to be able to attend a lecture by Professor Wayne Grudem in Budapest. He spoke about the necessity to uphold and revise doctrinal statements and laid out principles that guide us in deciding what to put in a doctrinal statement. This lecture comes at a great time for us as we are in the foundational stages of our church plant. The lecture stirred fruitful conversation in the car ride home and was a blessing to us. 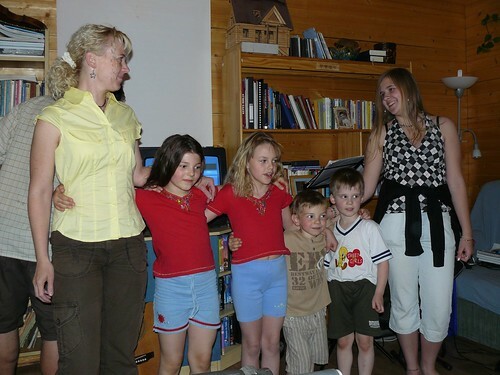 I was thankful that God made a way that Miki, Erika, DezsÅ‘ and Marcsi could attend. Teenagers Niki, Gabi, Zoli and Dávid joined Miki, Hugi and I at a teen conference in the town of Egerszólát. We were thankful to have Dávid come as he has completely fallen out of fellowship with the church. It was a good time to express our love for him and our concern for the decisions he is making in life. The messages delivered were excellent for all the teens and revealed God's power to take people who are incompetent and equipping them to live a new life that requires God's competence in them. 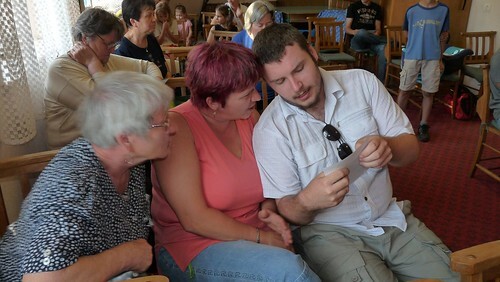 Above: Teenager Zoli with his mother Ildikó and grandmother Magdi in church. 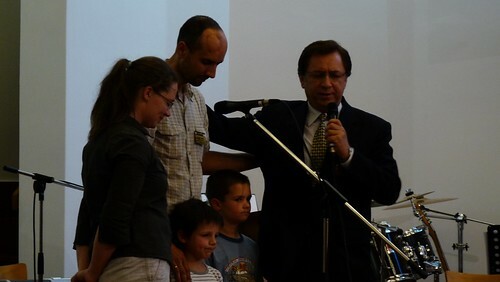 Last year, both Ildikó and Magdi stopped attending our church and fell out of fellowship with us. Zoli also struggled in his spiritual life. God was faithful to strengthen Zoli and keep him on the path of growth, and this year his mother began attending a small group study again. 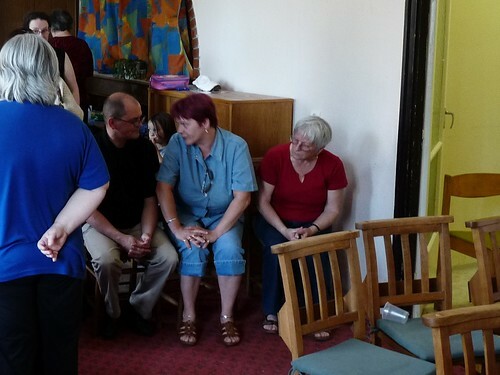 Just two weeks ago, both Zoli’s mother and grandmother returned to worship with us. One of our pray requests is that God would bring entire families to Himself and into our church. We hope that Zoli’s family would be strengthened in their faith and become an answer to our prayers. Above: Heidi and Roger returned to church with their new baby girl Emily! We would appreciate your prayers for our Elianna as she continues to have a mild fever (now for the fourth week). Please pray for complete healing! After our study was over, Timi brought up an unrelated question about the gospel being a free gift. 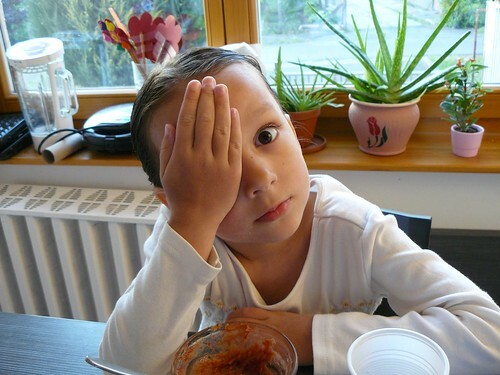 Timi said, "Won't people just keep sinning and then simply say, oh God will forgive me anyway." I was able to share with Timi that those who have put their faith in Jesus Christ have a change of heart brought about by the work of His Holy Spirit. Those who truly put their faith in Jesus have the same desires, and see His teaching, His commands, and His leadership as good and not restrictive burdens. This is the difference between religion and a relationship with Jesus. Though we continue to struggle with sin, we have a deep desire to be free from it. Though we fall into sin, we don't accept it as a place we want to be, but rather call out to Jesus to cleanse us again, and to help us live in the freedom He has already won for us. Those who claim to be Christians, saved by grace and show no evidence of love for Jesus and no personal regard for His commands are fooling themselves. Jesus was clear when He said, “If anyone loves me, he will keep my word, and my Father will love him, and we will come to him and make our home with him.” (John 14:23) This pursuit of being like Jesus is not driven by fear that God will reject us if we don't do enough. This pursuit is driven by the Holy Spirit who reassures us that we have a new identity as God's children. (see Gal 4:4-6) Our pursuit of holiness is driven by the knowledge that God already loves us. We WANT to live by our Father's ways that we fully believe are best. Every Thursday, Miki leads a study focused on foundational truths of our faith for members of our church. Some praises include the following: Hugi brought up an incident where she was being verbally abused by family members. Miki was able to reiterate our inherent value in Jesus Christ as a redeemed member of His family. This allowed Hugi to begin to grasp a Christian's ability to not be overcome by such insults, but to remain encouraged by turning back to Jesus. 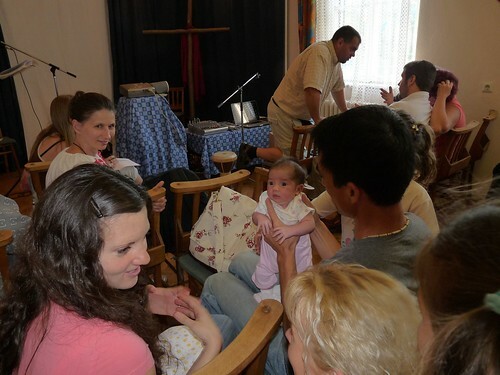 Eszti, a young mother of four who also attends was encouraged. Above: Eszti is also often talked about as being weak and irresponsible for having so many kids at a young age. 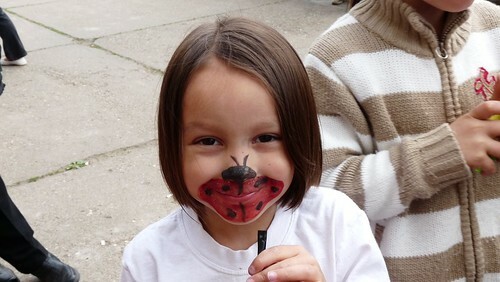 However, when we as leaders survey the church Eszti always stands out as a member who is constantly growing in her faith and full of wisdom for her age. Miki and other members were able to encourage her in the way she has been mothering her children in dependance on Jesus. This is a sign of her strength and maturity. Praise God for these church members that have been growing each week gaining insight in how to live according to Jesus' commands found in God's Word. 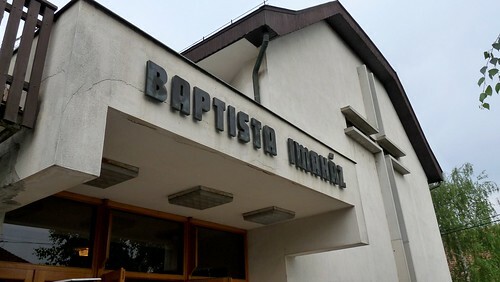 On Friday, we set out for the town of Békés for Hungary's Baptist Convention where our church would officially be received by the Hungarian Baptist Church. This is the culmination of a process that we have been in for the past two years which gives our local body legal standing in the country and brings various means of support for our long term church planting efforts. 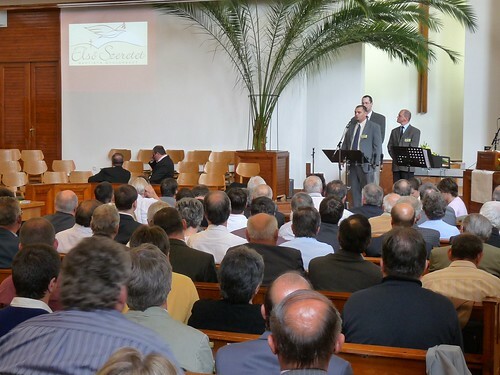 It was a joy to see over 130 men packed in the assembly, hearing older men preach with humility and hearing a constant focus on exalting Jesus Christ. Above: President of the Baptist Church sending out Hungarian missionaries to bring the gospel of Jesus Christ to Mongolia! Above: Istvan, Miki and DezsÅ‘ I spent most of my time with Miki and DezsÅ‘ (my hungarian church planting partners in ministry) and also Jonatán and István, who are church planting in the city of Gyöngyös just half an hour away from PetÅ‘fibánya. I think the car ride back and forth with these guys was just as helpful and encouraging as the convention itself. 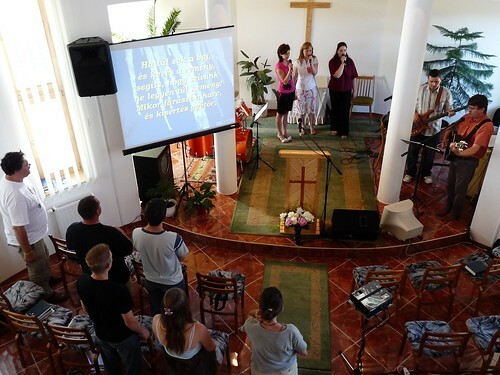 For the past four years, we have worked on various ministries together and we have the same desire to see a church planting movement in the North Eastern region of Hungary. We are always able to glean insight from each other as we are both in different stages of our respective church plants and we have high regard for one another. I praise God for having friendships with such men of faith, who love Jesus and are fully devoted to their call as church planters. On Saturday at our lunch break, DezsÅ‘ shared with Miki and I how God was speaking to him. He said that he still wasn't 100% sure, but it just seemed like God was stirring his heart to make a commitment to becoming a pastor. DezsÅ‘ said, "For so long, I have thought that I am just too old. But I have heard over and over at this conference from the Lord that my age doesn't matter. I don't want to deceive myself and conjure up these thoughts, but this is what I seem to be hearing from Him." 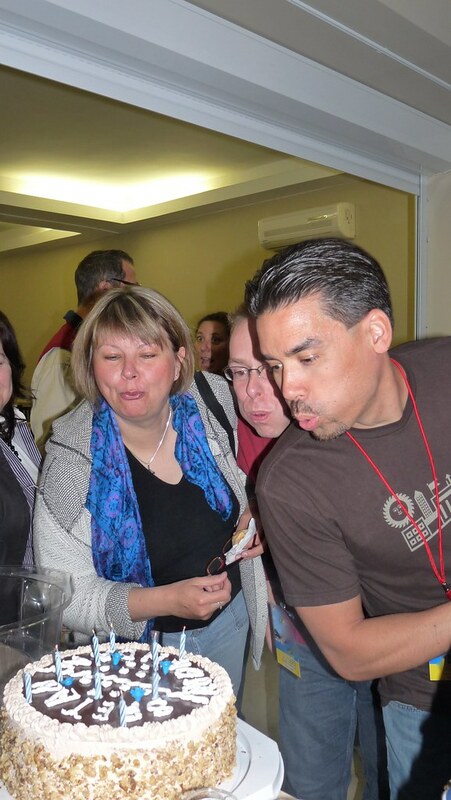 Soon after this lunch break, Miki, DezsÅ‘ and I headed to a break-out session with the topic of discipleship. The facilitator of the group asked that each person give a short introduction. The seventh person to begin introducing himself said this, "I was nineteen when God called me into the pastorate, but I resisted and I ran the opposite direction for a long time. God turned me back many years later and called me again by his grace into the pastorate at forty years old. I went to Bible school and am now serving as a pastor." At this point, this man who had no idea what Miki, DezsÅ‘ and I were talking about at lunch, looked right at DezsÅ‘ and said, "The reason I say all of this is that you are never too old to be a pastor." Talk about confirmation! DezsÅ‘ continued to share with us on the ride home how these things were settling in his spirit. He is stepping out in faith and will pursue this calling by God's grace. Above: Ready to worship, Hugi, Lidia and Brenda. Lidia is back from a few weeks absence because of a miscarriage. God has been gracious to comfort her in her loss and sustain and strengthen her faith through this time. Above: We rejoiced to see teenager Zoli’s mother and grandmother attend our worship service after leaving our fellowship a year and a half ago. Over the past few months, Zoli’s mother has attended a new Bible study at Miki’s house and Miki has seen new growth in her understanding. She has been spending more time in God’s word and in fellowship with other believers. Please pray that both of these women would grow in their relationship with Jesus and be drawn out of isolation and deception. Above: Hungarian married couple Nora and Tamás who are soon moving to a village just half an hour away from us visited our church tonight. They don’t know all the details of what God is doing, but they sense His calling to have them involved in church planting work. This is the first time we have met and we hope to see how we can equip and encourage or even work together with them in the future. 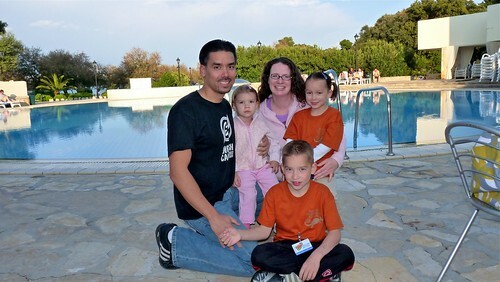 • Church planter partner Miki’s wife Erika was hired for a job in a local Autistic Care Center. God ordained all that was necessary for her to find the opportunity, be interviewed and be hired. She starts in September. • Edina, Timi and Klári attended our English Bible Study and remain open and seeking. 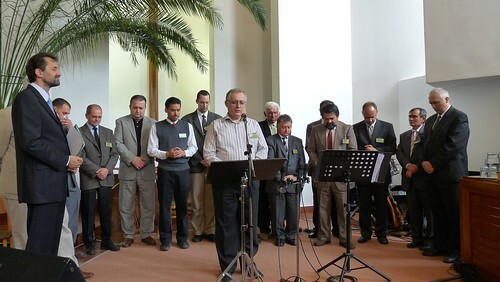 • Acceptance into the Baptist Church of Hungary and encouragement from their focus on Jesus Christ. • Over the past two weeks, Elianna has gone from a 103 fever, to croup cough, to hives. Praise God she tested negative for the flu, so most likely she is battling some virus, or viruses. Please pray for her complete healing. 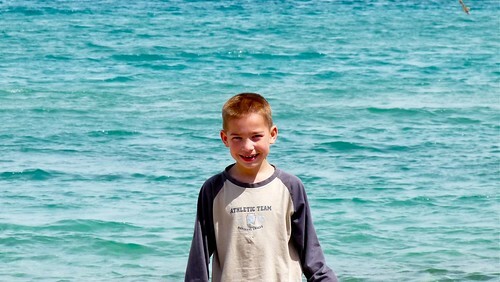 • Ben was officially diagnosed with celiac disorder along with his sister Elianna. Please pray for them as they transition into a gluten free diet, and pray for Sharon as she seeks to prepare food they will enjoy. 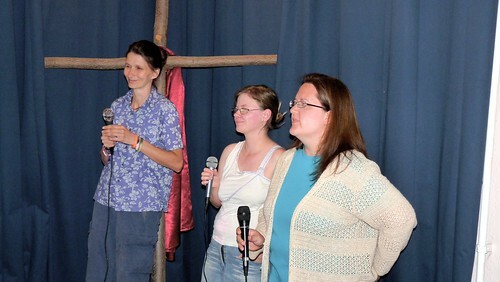 Above: Erika leading the kids as they sing a song in honor of mothers in our church. 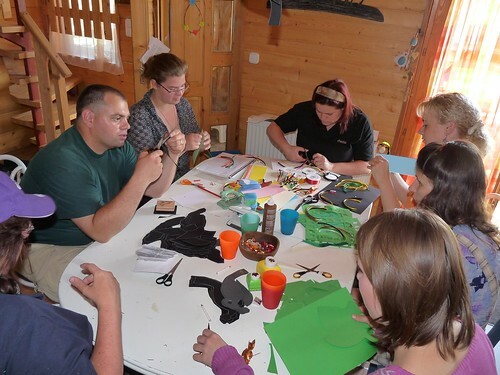 Erika has been hard at work over the past year getting a degree in special needs education. Apparently, she already had a degree, but through laws that were changed over the past year, she had to go back to school to be ‘qualified’ again. Erika hopes to use this investment in the lives of children in PetÅ‘fibánya as we seek to launch a Christian Daycare in the future. If you are interested in helping us jumpstart this Daycare, please see more information here. 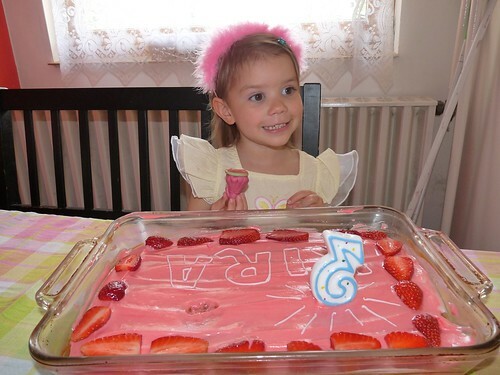 Above: Elianna is doing well adjusting to her gluten free diet after being diagnosed with celiac disorder. 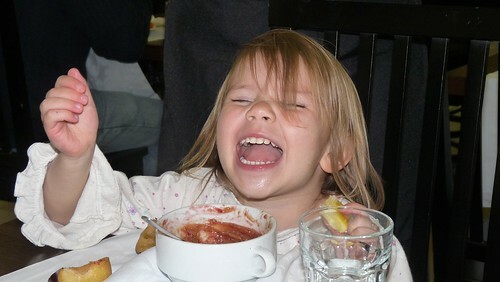 Sharon finally found success with one recipe for gluten free pancakes after a series of thumbs down by Elianna. We appreciate your prayers as Sharon continues to organize recipes, ingredients and meals for the family. Above: Ben (goalie outfit) playing in a soccer tournament the day before his surgery. Once again, his team came in last place, but they had a great time. Above: Ben slowly waking up after his outpatient biopsy. The procedure went well and once Ben was asleep, the surgery was less than twenty minutes. 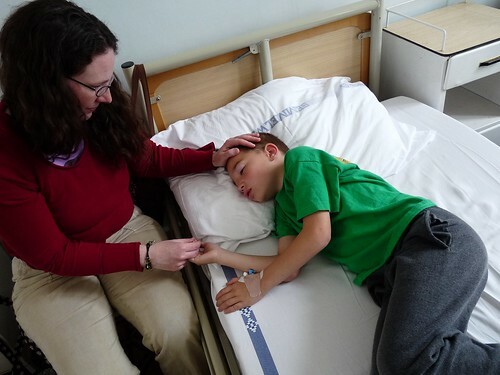 The doctor told us after the surgery that in contrast to what he saw in Ellie's biopsy (clear indication of Celiac), Ben didn't have any conclusive damage to his small intestine. This is good news! He said that the samples that he took will have to be tested for a clear diagnosis. The results should return in two weeks, and the doctor said that Ben didn't have to stick to a gluten free diet until those results come. Ben was happy to hear that! Above: Our team is already hard at work preparing for our upcoming VBS next month. 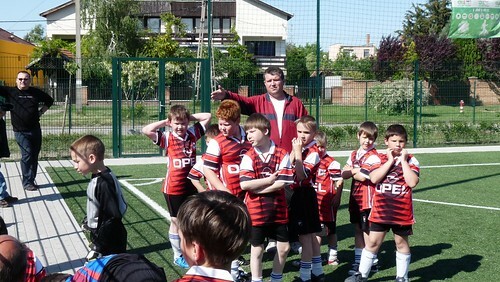 We already have twenty six kids registered and expect more in the following weeks. Seated at the end of the table (in black) is one of Miki and Erika’s neighbor’s Erika who also offered help. Miki and Erika have been reaching out to her over the past few months and her daughter has attended our past VBS camps. Please pray that Erika and her family would come to know Jesus Christ as their Savior and Lord! Above: Laszló, Éva and Allen painting the facade to our themed prayer museum for VBS this year. 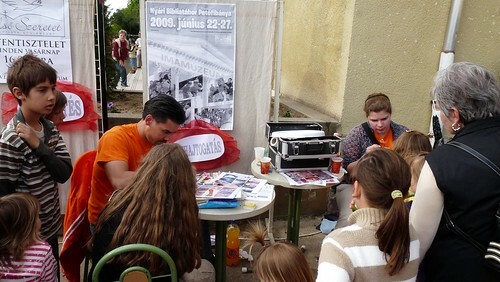 Above: Elianna was even to give a helping hand with Hugi and Julika (far left). 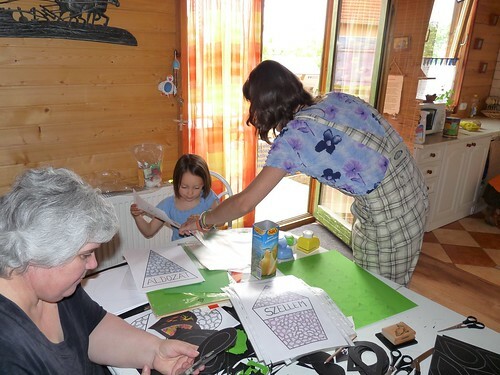 Julika is responsible for writing the curriculum for camp. Please pray for her as she has just been diagnosed with thyroid disease (after a recent bought with cancer). Julika is a widow with three children and needs God’s strength, wisdom and leadership. She truly pours herself out to glorify Jesus! 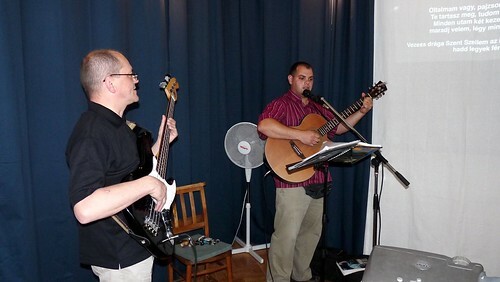 Above: Church members, Gabi, Gábor and Miki. Praise God for visitors, Kata (teenager Gabi’s mother) and Kristian (who attends our teen outreach) for attending church on Sunday. Part of our service involved a small group discussion, and DezsÅ‘ was able to encourage and reach out to Kata who was in his group. Kristian went downstairs with the kids and we were thankful for our friends Val and Jill who commuted from Budapest and led our children’s Sunday school. Above: Val and Jill (left), Miki and Brenda (right). Above: Kira, somehow remains cute even though she has been sick with a fever and runny nose for the past week. We celebrated her third birthday, exchanging gifts, eating cake and playing some kick ball in the 80 degree weather today. 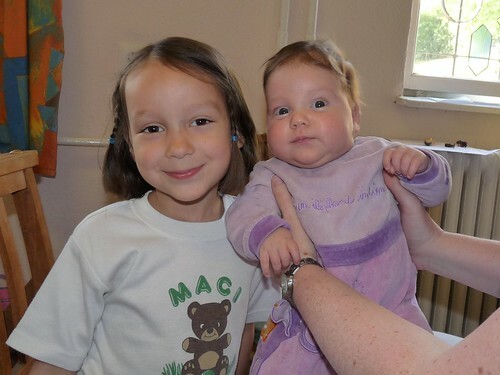 - For God to heal Kira and Elianna from a nasty virus and croup. - For Miki leading a Bible study Tuesday night for those open to spiritual things. - For Miki leading a discipleship study Wednesday for members of our church. - For encouragement and edification of Miki, DezsÅ‘ and Allen as they travel to a Baptist conference on Friday and Saturday. Above: Last week we packed the car and took a 10 hour road trip to an island just off of Split Croatia for a Pioneers Conference. Above: Some of my favorite shots of the kids at the conference. We were blessed with a church who sent a team of children’s workers to teach our kids throughout the week. 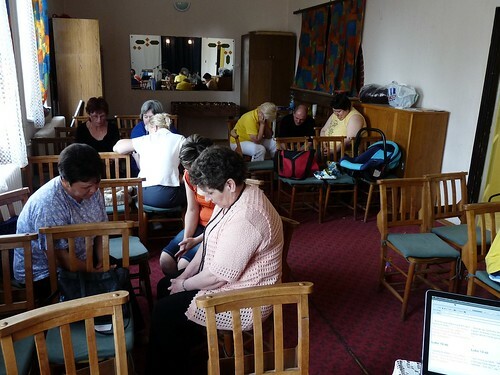 Our sessions were mixed with worship, prayer and teaching on various aspects of finishing well. Above: Allen celebrated his 37th birthday while at the conference. Above: The local government invited us to set up booths for face painting, games and balloons today as they celebrated their 60th anniversary. We used this as an opportunity to get the word out for our upcoming VBS, passing out flyers and inviting people personally. We are thankful that we already have 26 kids registered and expect that to quickly double. Our VBS has been an excellent way to reach the kids in PetÅ‘fibánya and the surrounding villages with the Gospel of Jesus Christ. This year the camp curriculum will seek to teach the kids about prayer with the Lord’s Prayer as a basis. Above: Teammates Heidi and Roger (above right) just informed us that their child Emily Louise Woo was born tonight at Telki weighing 2.9 kilos. 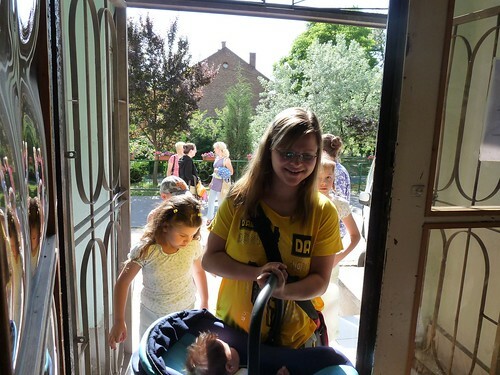 We praise God for blessing them with Emily and for God’s provision of quality health care in Hungary.